In the 1970s, big business concerned itself exclusively with getting results, irrespective of negative effects on employees. 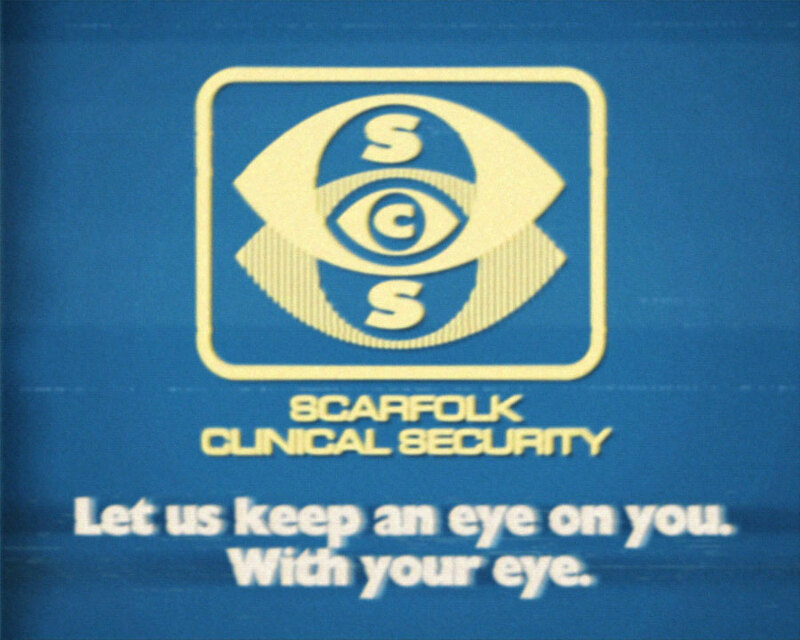 Some Scarfolk companies were so successful that the state's secret service turned to them for advice on how to get more productive results when interrogating dangerous terrorists. In 1972, under the guidance of management staff from a Scarfolk pickle factory, imprisoned terrorists saw their holidays reduced to 25 days per annum, lunch breaks reduced to 30 minutes, and per diem expenses decreased from 5 pounds to 3 pounds. 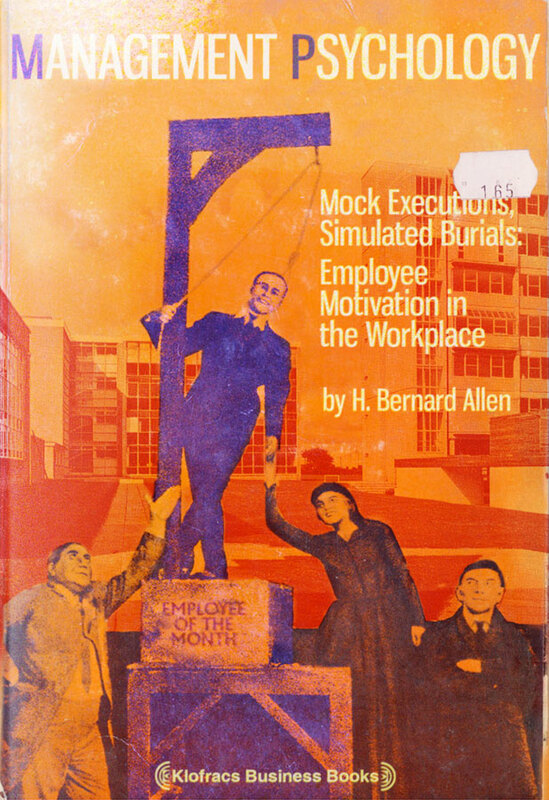 They had to participate in regular trust and team-building exercises, such as group games, sing-a-longs, waterboarding, sensory deprivation and, as the book indicates, mock execution - all the techniques that had made British business profitable, at home and abroad. But when interrogations were further reduced to 3 days per week and some detainees were even made redundant, many terrorists said enough was enough and went out on strike. They refused to engage in any interrogations until a full 5-day week, as well as tea breaks and afternoon naps were reinstated. 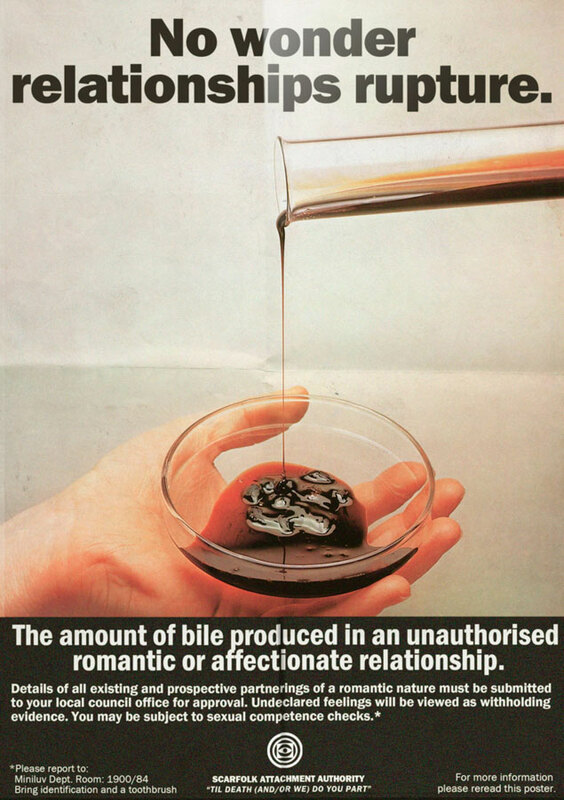 The romantic bile awareness campaign was launched on Valentine's Day, 1979. It came about following medical research into "that pernicious malady: love", which scientists believed was responsible for the secretion of a mysterious black bile produced in the hearts of the afflicted. The bile perplexed experts, some of who claimed it to be sentient, though all agreed that it caused irreparable damage to internal organs including the lungs, kidneys and luncheon balls. But it was the brain that was the most susceptible to the bile which could trick the sufferer into demeaning acts such as befriending foreigners and other undesirables. While the state did turn a blind eye to restrained fondness between its citizens, it could not permit love, requited or otherwise, to go unchecked. As the poster states, all relationships required authorisation from local councils and sexual proficiency was evaluated by a social worker. In addition to relationship management, Scarfolk council also drew up a definitive list of human traits that it deemed attractive, thus potentially dangerous. Anyone who fulfilled more than three attributes was forced to attend a plastic surgery course during which they were taught self-surgery techniques and given a sterilised Swiss army penknife to ensure compliance with the government's guidelines on physical attraction. 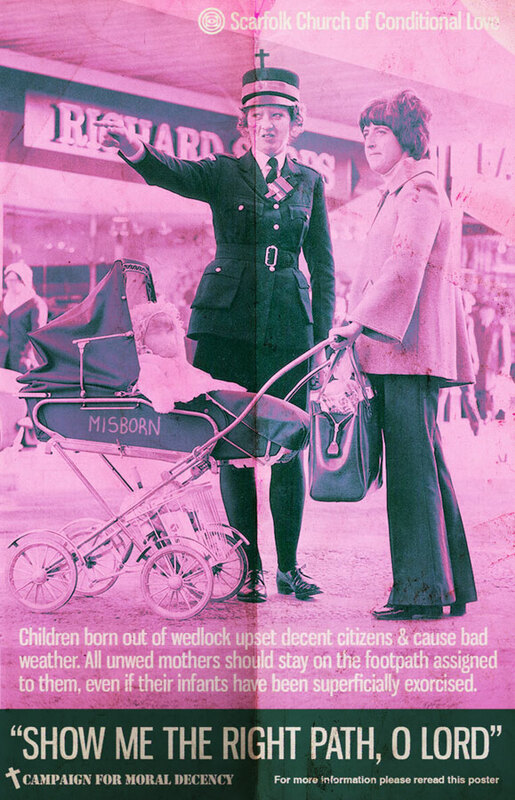 Unfortunately, there's only scant reference to SCS (Scarfolk Clinical Security) in our archives. 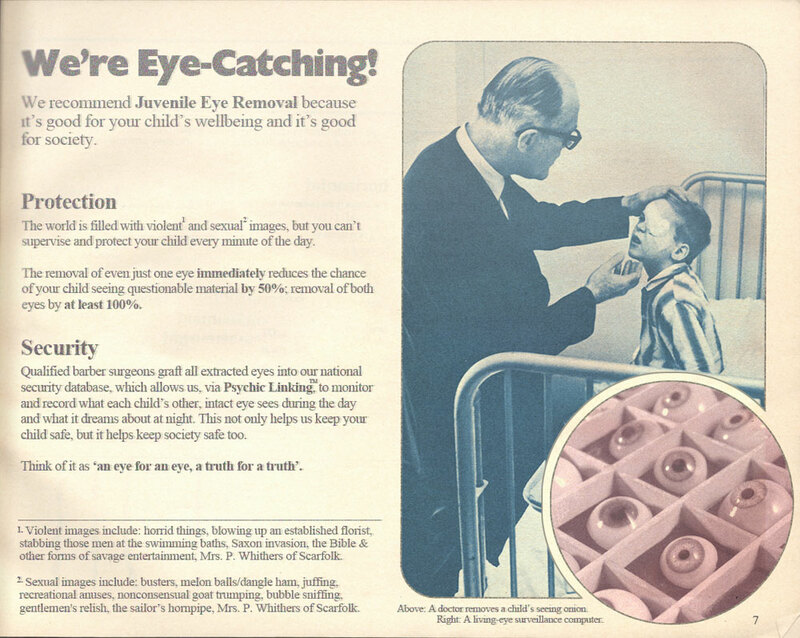 All we have is a screenshot from one of their television commercials and a page from a pamphlet given out by family doctors in the mid-1970s. In 1973, SCS caught the government's interest when it claimed that it could combine and reduce the state's annual budgets allocated to the war on crime, censorship, organ donation and breakfast catering. As you'll read below, the company proposed that reluctant citizens physically participate in the state surveillance process. Though the scheme was voluntary when it began, it quickly became mandatory. 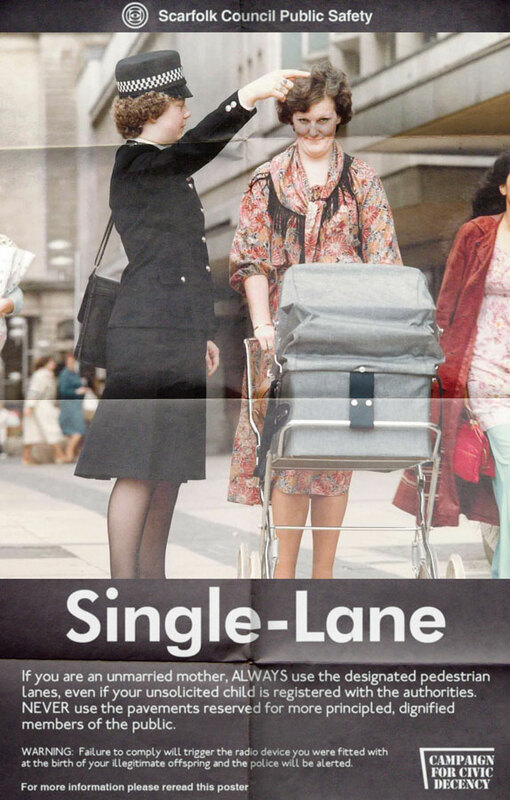 However, in 1976 the scheme suddenly collapsed and SCS went into liquidation. The company had already collected the initial 17,001 eyes that were required to run its living-eye surveillance computer, when it realized that it had neglected to invent an eye-to-computer adapter cable. The now redundant eyes were returned to their donors with a complimentary display stand (actually, an egg cup with 'thank you' painted on it) and a letter that read: "Be proud that you can look yourself in the eye in the knowledge that your eye was once the nation's eyes and ears".